The price of a gallon of regular unleaded gas went up for the 12th consecutive week, bringing the average national price to slightly more than $3.71, the highest fuel prices have been in almost 14 months. The new figures were released by the U.S. Energy Information Administration as part of the agency’s weekly fuel price survey. For many drivers, the price of gas has either approached or far surpassed the $4.00 per gallon mark, particularly in urban areas an on the west coast of the U.S. Drivers in Chicago are paying an average of $4.03 per gallon, while further west, in California, commuters in San Francisco are paying an average of $4.27. 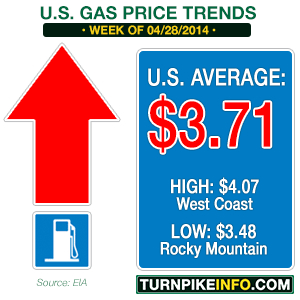 In Los Angeles, the price is $4.33, on average. Drivers on the east coast are enduring much the same fate, with the average New Yorker paying about $3.78 per gallon. Drivers in Miami were paying an average of $3.83 per gallon, and some stations in Fort Lauderdale, where TurnpikeInfo.com is based, were charging $3.95. 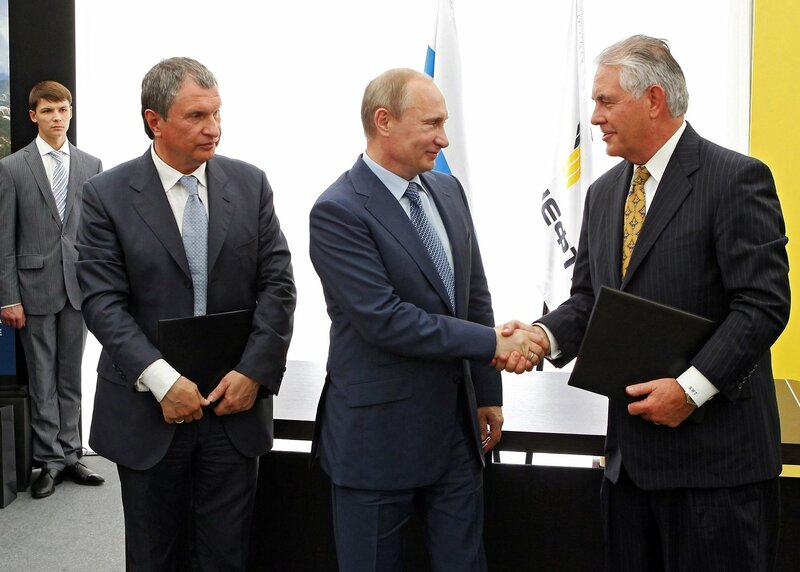 ExxonMobil’s point man cutting a deal: Igor I. Sechen shakes hands with Russian Pres. Vladimir Putin in a celebrated contract that will, at least for now, be in abeyance. Mr. Sechen is one of several Russian people targeted by new U.S. sanctions that have created complications for the energy sector. Photo: Mikhail Klimentyev via New York Times. New sanctions against Russia and, in particular, many of the monied inner-circle of President Vladimir Putin have pushed energy prices higher, once again. Investors bid higher on futures contracts for West Texas Intermediate on Monday, after the Obama Administration announced new sanctions that hit Russia’s energy sector hard. WTI for June was again moving higher Tuesday, with prices up $1.28 in early trading. Among the Russian businessmen hit by new sanctions is Igor I. Sechen, the head of the state-owned Rosneft, which happens to have contracts in the United States with ExxonMobil. Mobil operates fuel stations on the tollways in Illinois. However, many of the turnpikes across the eastern seaboard are operated by Sunoco, which has a presence in Ohio, Pennsylvania, New Jersey and Delaware. Shell operates stations on the Florida’s Turnpike. It was unclear how the sanctions would continue to affect business deals and, consequently, gas prices for consumers. The New York Times reported late Monday the leaders of many American and European oil companies had been working various contract deals for new oil exploration with Mr. Sechen, including direct conferences with Mr. Sechen and President Putin. Shell and ExxonMobil both conduct their own exploration and drilling, according to their investor websites. That could insulate both companies against some of the short-term price changes in crude. However, Sunoco’s investor website reports that company buys its crude on the open market, which could make Sunoco more susceptible to fluctuations of WTI and its foreign-oil counterpart, Brent Light Sweet Crude. No futures market has as much direct impact on consumers as the price of gasoline futures, which are up significantly in the past month, alone. Contracts for May delivery were at $2.81 per gallon on April 1, but as of midday on April 29, the contract was selling for nearly $3.05 per gallon. Current gasoline futures on the New York Mercantile Exchange, NYMEX, are at their highest levels of the past three years, according to NYMEX historical data.